Two brothers in a village in the Pratapgarh district of Uttar Pradesh were stoned, just one incident in a series of attacks on them. Their crime? They are Dalits, and had passed the examinations for the Indian Institute of Technology. 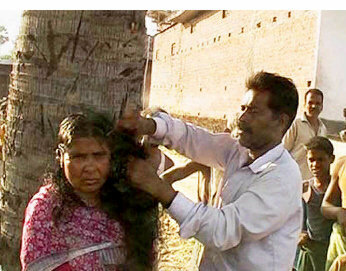 This was not acceptable to the upper-caste villagers. The brothers, Raju and Brijesh Saroj, are sons of a daily wage labourer living in Rehua Lalganj village. Intelligent and committed, the boys 18 and 19 years respectively, spent their years studying hard, topping school examinations and getting scholarships. They have faced harassment, violence, abuse for this with Brajesh at the age of 10 being thrashed by a school teacher for daring to question his Sanskrit translation. Despite this both boys have dreams. Brijesh wants to join the civil services, his brother the MBA. The family lives in two tiny rooms. They do not have the money to pay for the IIT education, but various politicians including Rahul Gandhi and state Chief Minister have come forward to meet this expenditure. At least so they say at the moment. India continues to maltreat and discriminate against Dalits, atrocities against whom have again risen over the past few years according to reports. Incidents take up about a paragraph in the newspapers, and very occasionally are highlighted. Even so little has been done to alleviate the apartheid like conditions in which Dalits are compelled to live with untouchability still rampant. Here are some incident that will prove the inhuman condition of dalits in our country. In October 2014, a mahadalit boy was burnt alive by four upper caste men in a Bihar village because the boy’s goat had strayed into one of their fields. The four men having previously thrashed the boy, who had then managed to escape, stormed the boy’s home and set him alight after pouring kerosene on him. The boy succumbed to his injuries. In the same month, three upper-caste men gang raped six dalit women, including four teenage girls again in Bihar. A few months ago, two Dalit children were brutally beaten and rusticated from a primary school in Rajasthan for drinking water from a matka (earthen pot) used by an upper caste teacher. The incident went unreported for over two weeks. In September 2014, a dalit woman was brutally beaten and her house torched in Memdarganj in Nawada district, Bihar. She was accused of practising witchcraft. Earlier this year, following tensions over the issue of the entry of Dalits into a temple, a dalit woman was beaten and stripped by higher caste assailants in Gangooru village in Belur taluk. In June, in Gugal Kota village in Alwar, Rajasthan, a young Dalit bridegroom was attacked because he was riding a horse to his wedding. The Rajputs in the village allegedly did not like the celebrations as these were seen as being beyond the Dalits “status”, and the boy was pulled down from the horse and the guests attacked and beaten. A few months ago, in Koliwad village in the Hubli district of Karnataka hair cutting salons shut down because a few Dalit youths wanted to have a haircut but fearing reprisal from the upper caste communities, the barbers refused to do so and shut down their shops. In New Delhi, about 90 Dalit families from Haryana have been camping for extended periods to demand justice for four gangrape victims. Their demand is to bring the culprits to justice and compensation to the victims -a demand that has thus far fell on deaf years. Crime against dalits are on the raise in Maharastra. In fact, violence against Dalits has been on the rise. According to data released by the National Confederation of Dalit Organisations, a total of 3,198 cases related to atrocities on dalits have been registered between 2004 and 2013 as against 1,305 from 1994 to 2003. Most cases still go unreported, with Dalits who continue to live in the outskirts of villages, drawing water from different wells and praying in separate temples fearing reprisal attacks.